Spanning a period from 2006 until December 2014, they include detailed briefings and internal analyses written by operatives of South Africa's State Security Agency (SSA). They also reveal the South Africans' secret correspondence with the US intelligence agency, the CIA, Britain's MI6, Israel's Mossad, Russia's FSB and Iran's operatives, as well as dozens of other services from Asia to the Middle East and Africa. The files unveil details of how, as the post-apartheid South African state grappled with the challenges of forging new security services, the country became vulnerable to foreign espionage and inundated with warnings related to the US "War on Terror". At times, the workplace resembles any other, with spies involved in form-filling, complaints about missing documents and personal squabbles.... One set of cables from the Algerian Embassy in South Africa relates to a more practical concern. It demands that "no parking" signs are placed in the street outside. The cable notes that the British and US embassies enjoy this privilege, and argues that it should be extended to Algeria as well. We've been talking a lot lately about how the new school of website design (with ReCode, Bloomberg, and Vox at the vanguard) has involved a misguided war on the traditional comment section. Websites are gleefully eliminating the primary engagement mechanism with their community and then adding insult to injury by pretending it's because they really, really love "conversation." Of course the truth is many sites just don't want to pay moderators, don't think their community offers any valuable insight, or don't like how it "looks" when thirty people simultaneously tell their writers they've got story facts completely and painfully wrong. "You can measure engagement by raw number of comments or commenters. Using Google Analytics, Livefyre and Adobe, Salon looks at metrics like the number of replies they make as a share of overall comments, how frequently they share Salon articles, and how many pageviews they log per visit. (Users who log in, which is required if you want to comment, view seven pages per session on average, while non-registered users make it to only 1.7, according to Dooling.) After it identified these top commenters, Salon has solicited their feedback and invited them to lead discussions on posts and even help moderate threads. ..."Comments aren’t awful,” (said Salon community advisor Annemarie Dooling). “It’s just the way we position them. The whole idea is not to give up on debate." That news is now a conversation and a community is something traditional news outlets have struggled to understand, so it's ironic that a major wave of websites proclaiming to be the next great iteration of media can't seem to figure this out either. For example Verge co-founder Josh Topolsky, spearheading the freshly-redesigned Bloomberg, recently argued that disabling comments is ok because editors are still "listening" to reader feedback by watching analytics and the viewer response to wacky font changes. But that's not the same as engagement or facilitating engagement. Similarly, Reuters and ReCode editors have tried to argue that Facebook and Twitter are good enough substitutes for comments -- ignoring that outsourcing engagement to Facebook dulls and homogenizes your brand. "I feel very strongly that digital journalism needs to be a conversation with readers. This is one, if not the most important area of emphasis that traditional newsrooms are actually ignoring. You see site after site killing comments and moving away from community – that’s a monumental mistake. Any site that moves away from comments is a plus for sites like ours. Readers need and deserve a voice. They should be a core part of your journalism." Now -- can you quantify and prove that money spent on community engagement will come back to you in clear equal measure as cold, hard cash? Of course not. But all the same, it's not really a choice. We're well beyond the Walter Cronkite era of journalism where a talking head speaks at the audience from a bully pulpit. We're supposed to have realized by now that news really is a malleable, fluid, conversational organism. Under this new paradigm, reporters talk to (and correct) other reporters, blogs and websites talk to (and correct) other blogs and websites, and readers talk to (and correct) the writers and news outlets. You're swimming against the current if your website design culminates in little more than a stylish uni-directional bullhorn. Want to see how an out of touch editorial board works? The Washington Post -- which continues to be a key player in publishing documents leaked by Ed Snowden -- has written a bizarre and totally tone deaf post about how the leaks need to stop before they cause any real damages. In fact, the first U.S. priority should be to prevent Mr. Snowden from leaking information that harms efforts to fight terrorism and conduct legitimate intelligence operations. Documents published so far by news organizations have shed useful light on some NSA programs and raised questions that deserve debate, such as whether a government agency should build a database of Americans’ phone records. But Mr. Snowden is reported to have stolen many more documents, encrypted copies of which may have been given to allies such as the WikiLeaks organization. It is not clear whether Russia or China hasobtained the material, though U.S. officials would have to assume that Mr. Snowden would be obliged to hand over whatever he has to win asylum in Moscow. Such an exchange would belie his claim to be a patriotic American and a whistleblower. At the same time, stopping potentially damaging revelations or the dissemination of intelligence to adversaries should take precedence over U.S. prosecution of Mr. Snowden — which could enhance his status as a political martyr in the eyes of many both in and outside the United States. Yes, this is an editorial board of a newspaper famous for breaking stories thanks to whistleblowers and leakers, including this very story, asking the government to stop them from being able to publish any more leaked documents. It's as if the Editorial Board of the Washington Post doesn't even realize that its own reporters have been key players in reporting on this story. Or, as Jack Shafer amusingly wrote: "Bart Gellman's stories are coming from INSIDE YOUR BUILDING!" For a newspaper that's small and underweight even by British standards, the Guardian has a knack for making some big noises, both in its home market and across the pond. And, in terms of newsrooms, apparently, they have nearly identical staff sizes. Oh, and then there's this: while the Washington Post has beaten the Guardian to a few of these stories, the Guardian is generally cleaning WaPo's clock in terms of its overall coverage of the leaks. Perhaps the Washington Post shouldn't let its jealousy show quite so much. It's a great little production, because not only does it effectively portray the potential of what is variously called open journalism, citizen journalism and participatory journalism, among other things, it also serves as a good example of a common mantra around these parts: advertising is content, and content is advertising. For years, we've covered stories of companies reacting badly to finding something they don't like about themselves online, and threatening to sue those who posted the content with libel. Many lawyers tend to go to extremes in threatening people, with the idea of scaring them into just taking content down. These days, of course, that's quite likely to backfire, as the recipient can just go public with it, and shame the company. Even so, it's rare for those companies to come out with a really sincere apology. 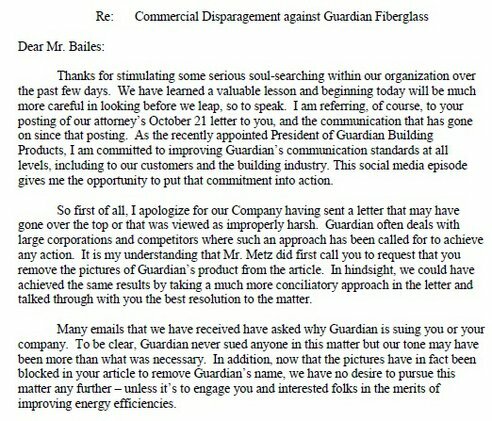 Aaron DeOliveira points us to an interesting story involving a building company, Guardian Building Products, that freaked out over a blog that showed "a lousy installation" of their insulation. The company threatened to sue, saying that the blog post "constitute[s] libel, slander and commercial disparagement." In response, the blogger, Dr. Allison Bailes, went public with the threat. And here's where Guardian realized that perhaps it was doing something really, really wrong. It sent a very apologetic letter: While you can (reasonably) argue that the company should have known better than to send the original threat letter, there is something to be said for owning up to the fact that you made a big mistake, and (hopefully) actually learning from it. Guardian Asks UK Gov't To Investigate Google News For Not Contributing To Journalism? It had seemed like perhaps The Guardian newspaper in the UK understood how the internet worked. After all, execs there had been saying that they hoped the NYTimes would start charging, since it would just drive a lot more traffic their way. However, it seems like not everyone at The Guardian is on the same page. Similar to Feargal Sharkey's call demand that the UK government investigate Google for not giving the recording industry money, The Guardian is now asking the UK government to investigate Google over its Google News product, specifically claiming that Google gets too much benefit from its content. Of course, there's a simple solution to this: take your news off of Google News (or take it offline altogether). But The Guardian doesn't want to do that. The reasoning is a bit convoluted, but, basically The Guardian says that since the online ad market is tough right now, it can't make enough money on the traffic that Google sends it. So stop accepting traffic from Google, right? No, it can't do that, because then competitors like the BBC would sweep up all of the traffic. Is it just me, or does this reasoning suggest that The Guardian should be asking the government not to investigate Google News, but the BBC for representing unfair competition? The Guardian's reasoning here is a bit tortured. It seems to be saying it can't compete with other sources due to Google News... even though those other sources have the exact same issue (getting traffic from Google News). It's only real complaint is that the BBC offers its content for free online -- and (though it doesn't appear to explicitly call this out), the BBC is publicly funded and doesn't have to focus on ad revenue like The Guardian does. So why isn't the complaint against the BBC instead of Google News? The Guardian always struck me as a pretty good paper, but the logic here is hard to understand. If it doesn't want the traffic, fine, don't take it (though, most people recognize that would be a mistake). If the problem is that it can't monetize the content effectively, then that's a business model problem for The Guardian -- not Google News. Finally, if the problem is (as it appears) competition from the BBC, then take it up with the BBC or those who fund it, but don't misplace the blame on Google News.